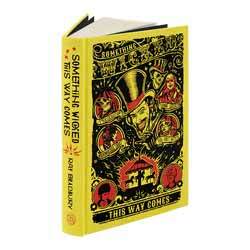 The Folio Society, London publishes the classic Something Wicked This Way Comes, by premium Science Fiction, Fantasy, Horror and Mystery writer Ray Bradbury. Originally published in 1962 by Simon & Schuster, this luxury 2019 reprint by permission of the Bradbury Estate is presented in hardcover, with good quality paper and wide margins. 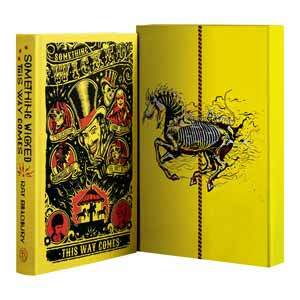 There are seven hauntingly beautiful red, yellow and black full-page illustrations by Tim McDonagh which are spaced throughout the book – including a skeletal carousel horse which adorns the hard slip case. There is an introduction by comedian, actor and Bradbury fan Frank Skinner, and an Afterward by Bradbury from 1999 called Carnivals, Near and Far. Ray Bradbury (1920-2012) is one of my top ten favourite writers of all time. His output was prolific and highly impressive. Furthermore, he couldn’t have been a better ambassador for the profession. Best known for short story collections such as Long After Midnight, The Small Assassin, The October Country, Dark They Were and Golden Eyed, I Sing the Body Electric, and The Golden Apples of the Sun (to name but a few), he also wrote a handful of timeless novels including Dandelion Wine, Fahrenheit 451, The Silver Locusts (The Martian Chronicles), and Something Wicked This Way Comes. The last time I read this book (I still have the paperback) I was in my teens or maybe early twenties. Around that time I couldn’t get enough of Bradbury, and devoured everything that was available. To my young and enquiring mind Bradbury’s prose was full of magic and poetry of phrase. Everything was wondrous and bright, and mystical and dark. In Dandelion Wine and certain short stories Ray Bradbury created a boy character called Douglas. To all intents and purposes Douglas was Bradbury himself, remembering his young and innocent days when everything was larger than life. You could say that in this story Bradbury is Will Halloway, the wide-eyed, sensible and cautious opposite to his neighbour and best friend, Jim Nightshade (the excitable and reckless half). They absorb everything around them as if seeing it for the first and last time. To modern day readers the first few pages will seem slow, but Bradbury is quickly setting the scene in his favoured month of October in a small town, and introducing the partnership of Will and Jim while things still seem mundane – so that the coming oddities will appear that much more pronounced. It soon takes off and a series of set piece events sweep you along for the ride. The Hall of Mirrors, the Dark Carousel, Will’s clash with the Dust Witch, Mr Dark and his mysterious Freaks, and particularly Will’s dad’s novel defence against the Dust Witch, and his marked bullet when he volunteers to shoot as part of a fixed stage performance; there are so many tense, exciting and sometimes humorous moments that it’s difficult to do justice to the whole. But it is in no way complicated or forced. Magical is the word. You might think this is solely a children’s book, however, the inclusion of Will’s father serves as a link between the generations, bridging the gap. So we get the thoughts, opinions and reactions of Charles Halloway as well as the boys. This is a book which spans any age gap. It is highly recommended for the Folio Society’s tribute to Bradbury and one of his major works.